Glenwood Day Care Centre in Castlemilk is the first day care centre to be completed as part of a transformation of services for older people in Glasgow. Glenwood Day Care Centre in Castlemilk is the first day care centre to be completed as part of a transformation of services for older people in Glasgow. 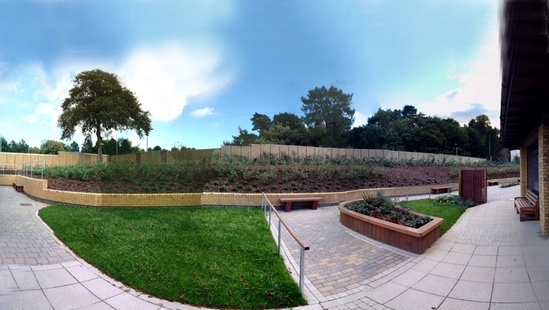 The new £2.4m centre had a focus on acute attention to detail and high-quality finish for its premises including the creation of a tailored and fully-accessible garden area. The specifications for the centre were developed with direct input from service users, families, carers, staff and other experts. 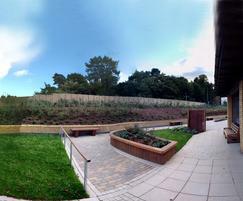 Woodscape designed and supplied a range of bespoke outdoor furniture for the garden space of the new centre. Products included retaining wall planters with coping; square tree seats, some with integral planters; Type 2 seats and Tooting benches. 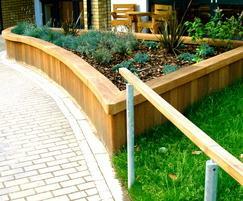 Woodscape’s furniture offers a high-quality and modern finish for this scheme where quality of life is very important. Every aspect of the scheme has been carefully considered to help residents and users make the most of how they live. Fulfilling the requirement for plenty of relaxed seating to have tea or meals outside in the summer, products are safe, sturdy and functional and the gardens now offer sensory stimulants with a variety of planting. Woodscape's retaining wall system, manufactured in naturally very durable hardwood, provides a quick and effective way of building retaining walls up to 1800mm high. In some circumstances, higher walls can be constructed.